Olympic National Park is an isolated area with a varied topography from seashore to glacier. It is the lowest altitude in the world in which glaciers begin at an elevation lower than 2000m and exist below 1000m. The park can be divided into three basic regions: the Pacific coastline, the Olympic Mountains, and the temperate rainforest. The park has complex and varied vegetation zones, with endemic wildlife including the Olympic Marmot. 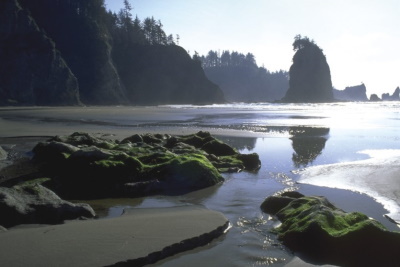 Olympic National Park offers a diverse landscape that includes glaciers, rainforest, and tide pools. With a rental car and early starts beginning at 5:45 AM, my wife and I explored all three major portions of the park over two days. We were blessed with 3 days of sunshine on the Olympic Peninsula during the Memorial Day weekend. Taking the earliest ferry from Seattle (6:10am) we beat all holiday crowds and never had an issue as we began exploring Hurricane Ridge. Deer and elk are common in several areas of the park, the alpine meadows of Hurricane Ridge are one such place, my binoculars were put to good use here. We stayed in Port Angeles, which allowed us to extensively explore Hurricane Ridge, the Elwha River, and Storm King Ranger Station. Elhwa River is truly a hidden gem and is almost universally ignored by visitors heading to Lake Crescent or to the rain forests. One of the greatest successes in Olympic National Park is the destruction of the massive dam on the Elhwa River. The demolition project was only completed in 2014. The salmon have returned! After 100 years this portion of the park is truly special and stands as an exemplar partnership between the National Park Service and Native American Tribes. Pictured below is a massive bloom of Spring wildflowers adjacent to the Elhwa river. The Hoh and Quinault Rain Forests were both superb, small and large trails are available. The moss and bird life are bountiful, though I slightly prefer the Quinault Rain Forest. 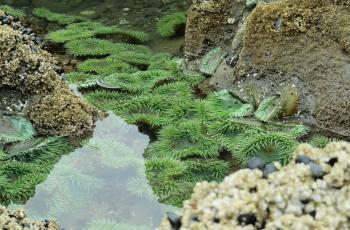 On the rugged Olympic Peninsula Coast, there are sea anemones in tide pools, sea stacks, and pristine coastline forests. This amazing diversity is the highlight of Olympic National Park, in some sense it feels like you are visiting 3 top notch national parks in one. Olympic National Park is one of those places you may never seen enough of .... on one side is Hurricane Ridge (with lovely mountainous views of the Olympic Mountains and of the Strait of Juan de Fuca), Lake Crescent (a pristine, clear lake with relatively little development) and our favorite, Rialto Beach (we saw a cluster of starfish, huge masses of bone-dry trees -- be careful, though, you have to watch the tide reports so you won't be on the water when high tide comes in: those trees start moving around). That's about half a day, if you want to see it all. It takes another three hours to get to the interior, where the Hoh Rainforest is located. It's a bit of everything all in one package! I've been longing to visit the temperate rainforest in the Pacific Northwest and it was definitely worth the wait! If your time is short like mine was, the heart of the park is the Hoh Rainforest, which is a 19-mile drive from the highway. Here, you will see heavy fringes of moss hanging from the trees, as well as nurselogs that have newer trees growing on top of them. I was also fortunate to see a banana slug. If you are a WHS plaque seeker, the plaque is located outside of the Hoh Rainforest visitor center, right beside the bathrooms. I hope to visit Olympic National Park again, since I missed Hurricane Ridge and Sol Duc Springs. One last thing, I was forewarned to bring my raingear (which I did), only to have a bright, sunny day. I guess it's better to be prepared! We visited Olympic National Park for a weekend once, and it's a beautiful piece of nature. We drove up to a campsite where we pitched up our tent, and after another drive through the forested mountains, we got out of the car and hiked into the forest until we ended up at a group of natural hotsrpings. All the springs were seperated from each other and the water was very warm. If there wasn't a rotting smell coming from it (due to all the natural gasses) it would have been very romantic. We spent the night in the hotsprings, but since I saw a documentary once about the park with its cougars and bears I didn't feel quite comfortable (who wants to be eaten in the dark in a hot spring?). The fact that we saw a bear and heared cougar sounds on our way back were a bit exiting. But the park is beautiful, great for a weekend (or longer!) getaway. Anyone who visits here had better like the color green and I'm not talking about money. It seemed like everything was covered with moss and other green growths, and the forest had a real primeval feel about it. If you're coming from Seattle, be aware that the distance is deceivingly long, and for a day trip you had better start early and plan on getting back late-not that it's not worth the time and effort. My visit to Olympic National Park happened some time ago, but I still remember vividly the enormous tress, high peaks, big glaciers, and breathtaking views. The vegetation especially was great and seemed to be right out of the Amazon jungle. Finally I knew what was meant by "temperate rainforest". A portion of the park is on the Pacific Ocean, and you can spend endless hours wandering along the untouched beach, seeing only birds, driftwood, and the occasional whale (seriously). For anyone visiting the Seattle area, this is a must-see. Went 'matsutake' (mushroom) hunting one weekend. It was a memorable day amidt the conifer and temperate rain forests, plus gravel beaches and alpine streams. Like most natural parks, it takes time to really experience it. Notable Trees: “ It contains one of the world’s largest stands of virgin temperate rainforest, and includes many of the largest coniferous tree species on earth." Criteria (vii) for Inscription "The Olympic rainforest, which reaches its maximum development within the site is, sitka spruce, Douglas fir, western red cedar, and others reach a living standing biomass here which may be the highest of anywhere in the world. " Advisory body Evaluation Official NPS park map includes locations for 3 Big Sitka Spruce Trees, 1 Big Cedar Tree, and 1 Big Douglass-fir Tree. Sea Stacks: "The rocky headlands, beaches, tide pools nurturing a living rainbow of colors and textures, off shore sea stacks topped by nesting seabirds and wind-sheared trees-all are a remnant of a wilder America." Glaciers: "There are about 266 glaciers crowning the Olympics peaks; most of them are quite small in contrast to the great rivers of ice in Alaska... (They cover) approximately ten square miles"
Natural sites with indigenous human population: Eight Olympic Peninsula tribes continue to recognize a relationship to the park based on traditional land use, origin, beliefs, mythology and spiritual beliefs and practices. These tribes are the Lower Elwha Klallam, Jamestown S'Klallam, Port Gamble S'Klallam, Skokomish, Quinault, Hoh, Quileute, and Makah. 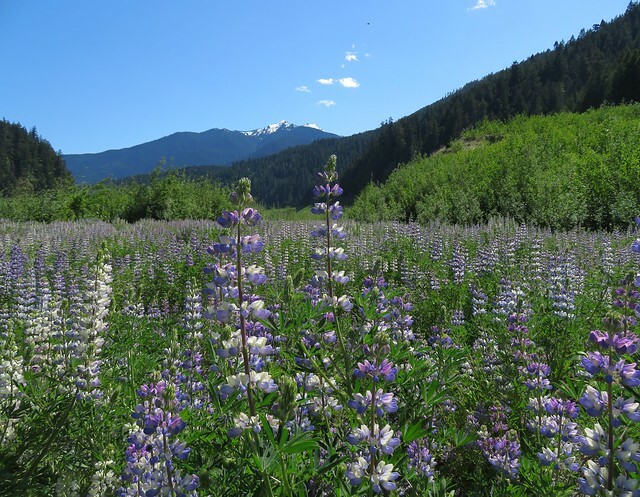 Holocene: The NP is almost entirely a "post glacial" creation " During the last Ice Age, continental glaciers surrounded the Park on all but its west side, with layers of ice up to 3,500 feet thick. This scouring by the continental glaciers created a noticeably sharp rise from sea level on the flanks of the mountains on the east and north edges of the Park. At the same time, today's river valleys were choked with floes of ice from alpine glaciers, the remnants of which dot the Park's mountains today"